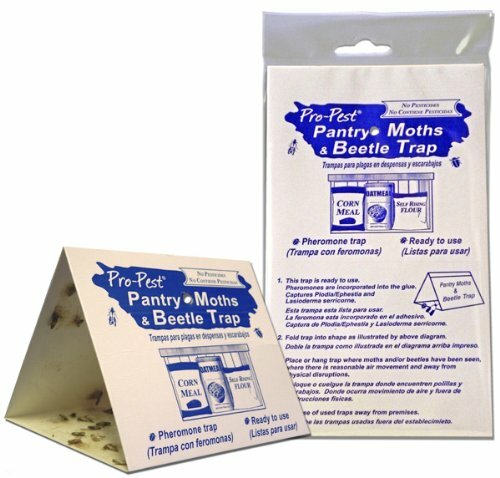 The pheromones in Pro-Pest Pantry Traps will attract Indian Meal Moth, Almond, Raisin, Tobacco, and Mediterranean Flour Moths and Cigarette Beetles. Each package contains 2 traps. Take one or two traps out of the plastic sleeve, fold trap into a triangular trap. Since pheromones are pre-loaded in the glue, it is ready to use! These pantry moth traps are easy to use, non-toxic, and extremely effective. The moth pheromones attracts the male moths and disrupt the mating process. These are the most effective moth traps we've found. To use, take one pantry moth trap out of the plastic sleeve, fold it into a triangular trap and place in infested area. That's it, they are pre-baited! The pantry moth traps can be hung or can be placed on a shelf. Change out as needed, or up to every two months. Each package contains two (2) traps.